Some characters deserve to walk out of their books and live in your heart. Washington Black transcends the pages of his own novel. Esi Edugyan made the shortlist for the Man Booker prize (and several others) with this story of a young man who was born in slavery but finally comes to own his own story. If this novel doesn’t touch your heart, you are already dead. Washington Black is a young man born into the brutal slavery of a Caribbean sugar plantation. Raised by a slave woman, Big Kit, he is owned by a violent master who kills slaves often. One night he is summoned to help serve dinner by the master, who is accompanied by a guest. We discover that the guest, known as “Titch,” is the master’s brother. Titch decides that Washington is the right size for his scientific experiments, and “borrows” him to help. Titch is building a lighter-than-air craft, and he needs an assistant. So, because he is the right size, Washington is chosen. Soon, though, Titch learns that Washington is not just the right size physically. He may have been born into slavery, but Washington has a keen mind and an amazing artistic talent. Titch quickly begins to rely more and more upon him, looking on him more as an apprentice than as just a laborer. When calamity strikes the family and Washington’s life is in danger, Titch does not hesitate to take him and set off in his aircraft to escape. What follows is a perilous trip, first to Virginia and then to Canada, fearing that bounty hunters were barely a step behind. As the years pass (and the two men separate), Washington lives on his own in Canada, then moves on to England. Yet questions abound in Washington’s mind. Why did Titch choose him? Why did Titch leave him behind? Why was he freed when Big Kit and the other slaves were not? Fundamentally, Washington wants to know who he really is, why he really is here–and also wants to deal with a large helping of survivor’s guilt. And to do this, he chases the shadows left by Titch in England and Amsterdam until finally confronting his rescuer in Morocco. And we, as readers, follow Titch in this quest, caught up with him in the maelstrom of life and emotions that make this book so compelling. Edugyan reminds us that slavery in the Caribbean was brutal and violent. Slaves are routinely beaten and killed. Washington is branded, along with the other slaves on the plantation. His first crush, Emilie, becomes pregnant at age 11, most likely from being raped by their master. When she disappears, he doesn’t bother asking about her. When people leave the plantation, they are just gone. They are never seen again, and there is no point asking. Washington does not know who his mother or father are; Big Kit raises him, but never tells him who his parents are (we learn a little more later in the book, but I won’t spoil it for you). Her love is a tough love–at one point she hits him so hard that she breaks his ribs. But her fear is that he will cross a line that will get him killed–or worse–by the master or his thugs. If he attracts the wrong sort of attention, broken ribs would be the least of his problems. 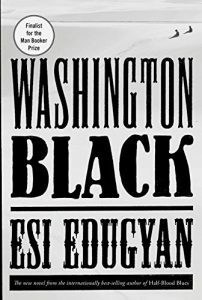 Washington Black deserves a place in your heart and on your shelf. It is a beautiful, compelling story with one of the most powerful characters you will encounter on the page. I am glad I read it.